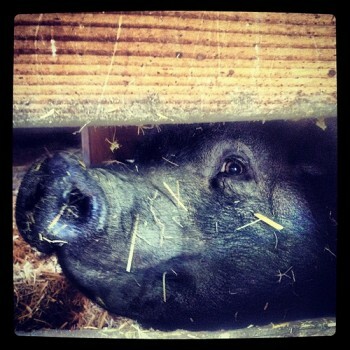 Monica the Potbellied Pig safely arrived at the sanctuary in January 2012 after a six-hour journey from Los Angeles. For the previous two months, Monica sat patiently waiting for rescue at the North Central Animal Shelter in LA. Prior to her arrival at the shelter, Monica was the victim of a cruel college prank at the University of Southern California. She was dumped on the USC campus, where she wandered around bewildered and frightened. She was later picked up by animal control on a nearby street. We warmly extend our gratitude to United for Animals and the individual supporters who donated funds for Monica’s transport to Stockton.